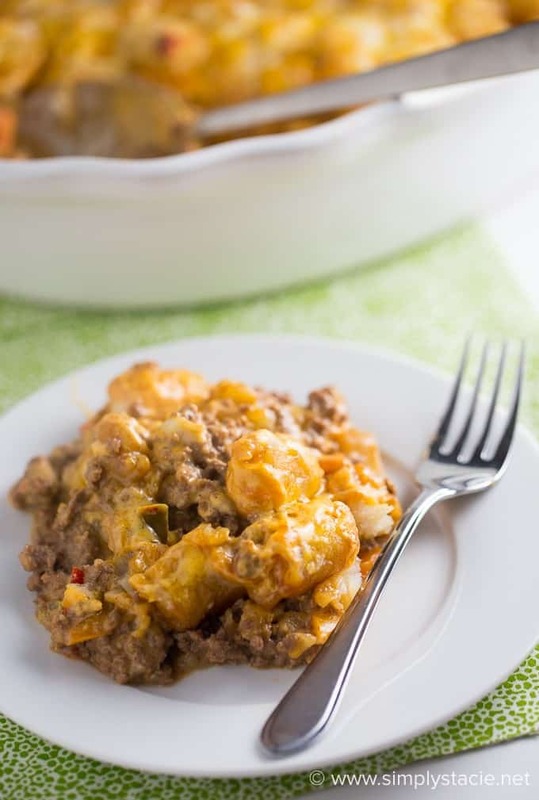 This Mexican Tater Tot Casserole was a hit with my family! It was spicy, hearty and tasty. Comfort food for the win. I originally intended to make a hashbrown casserole, but that did not pan out. Do you know how hard it is to find shredded hashbrowns in Canada? To me, it feels impossible! I checked every single store in my area and came up empty. They only had the diced hashbrowns. Then I saw the Tater Tots and a new idea was born. Scrap the hashbrown casserole idea and hello Tater Tot casserole. It was a huge hit! 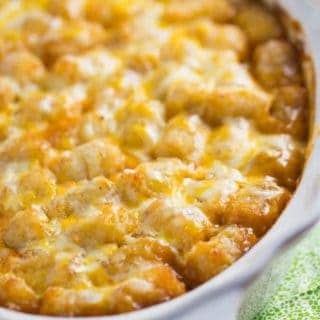 I’m sure you’ve seen Tater Tot casseroles before and probably have even made them yourself. This was my first attempt. I decided to give mine a Mexican flair using taco seasoning, peppers and queso. 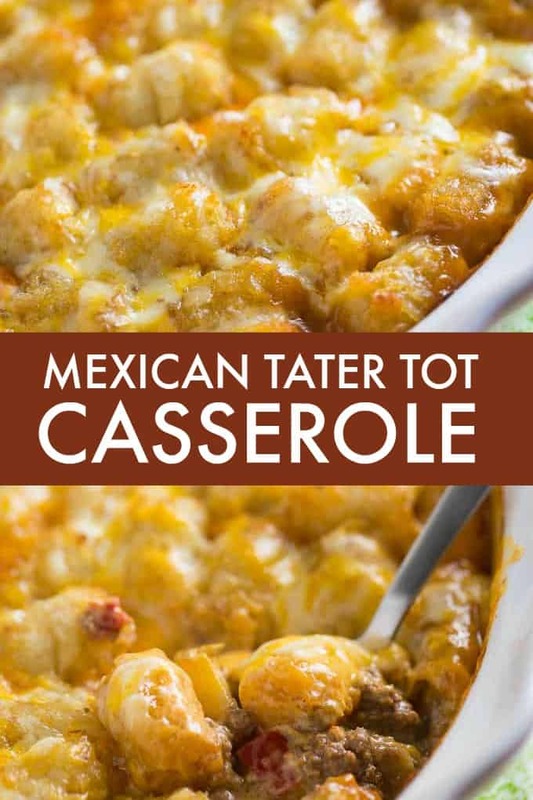 Hello Mexican Tater Tot Casserole! The bottom layer is a mixture of spicy ground beef, peppers and onions. It tastes like you would expect – the filling for a taco. Then I topped it with an entire jar of queso. Queso is basically melted cheese sauce with chiles. Look for it in the chip aisle with the tortilla chips and salsa. The one I used was Tostitos brand. Frozen Tater Tots covered the top of the casserole dish. Don’t worry, they will thaw and cook in the oven. During the last five minutes of baking, I added shredded cheese. If you had this at the beginning, it will burn. You only want it to melt on the top. It’s a little spicy, hearty and a yummy comfort food to fill your belly. John told me it’s one of his favourite meals I’ve made. I’ll be adding this recipe to our meal plan regularly! I may try other combinations to experiment a little. If I find any good ones, I’ll share the recipe, pinky promise. To start, you’ll want to cook the ground beef, onions and peppers. Add them to a large skillet over medium heat to cook for about 7 to 8 minutes. I like to use a Meat chopper to break up the ground beef. It makes the job effortless. Once you’ve got the ground beef and veggies cooked, stir in the taco seasoning. I used a whole packet. Time to assemble the casserole! 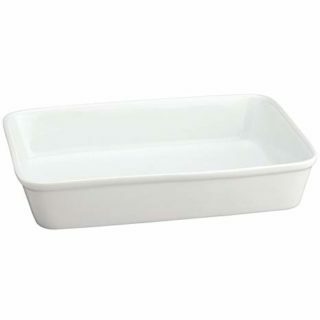 Grease a 9×13 casserole dish with cooking spray. Spread the ground beef mixture on the bottom. Top with Queso and then cover with frozen Tater Tots. Bake the casserole for 40 minutes at 400F. Remove from the oven and sprinkle with shredded cheddar cheese. Bake an additional 5 minutes for the cheese to melt. Can You Freeze Mexican Tater Tot Casserole? Yes, you can freeze Mexican Tater Tot Casserole. Just make sure it’s covered and eaten within 3 months. No one likes freezer burn! 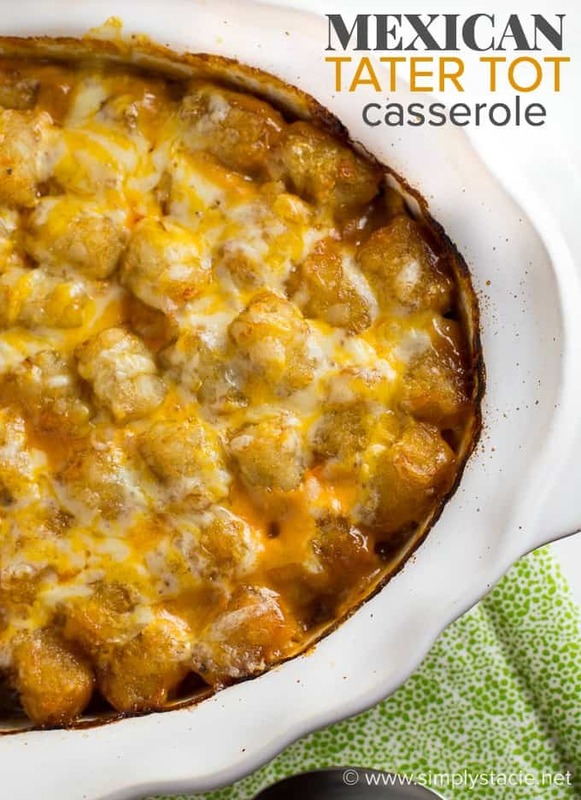 We love Tater Tot Casseroles! In fact, I have a couple different varieties shared here in my recipe box. 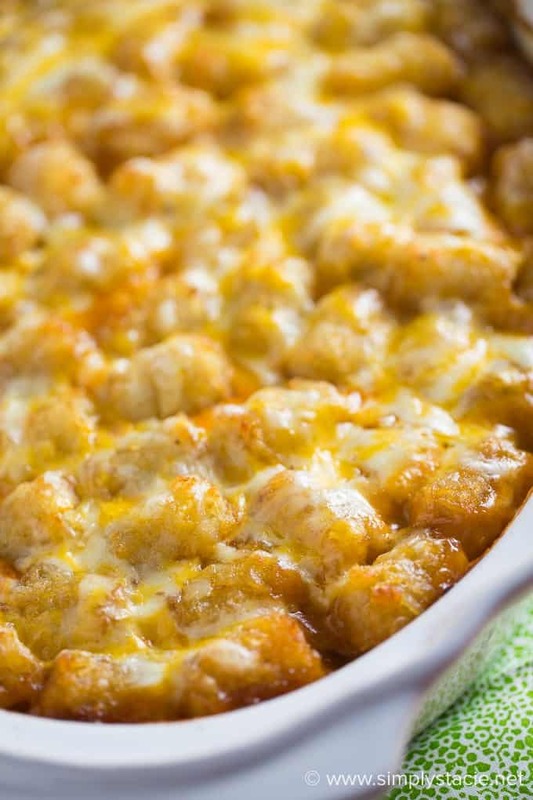 Tater Tot Casserole: A classic comfort food casserole your family will love! It has a layer of ground beef mixed with a creamy veggie sauce and topped with crispy Tater Tots and melted cheddar cheese. 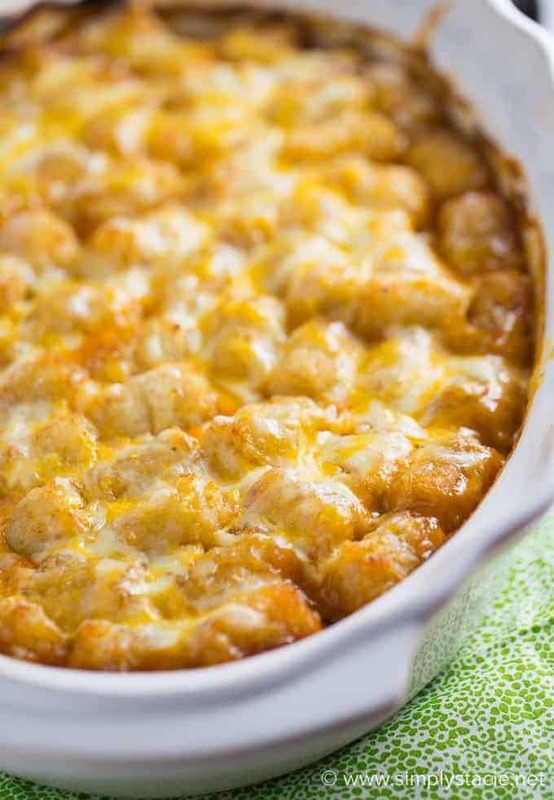 Lasagna Tater Tot Casserole: Easy, delicious comfort food! This casserole is one of my family’s favourite weeknight meals. 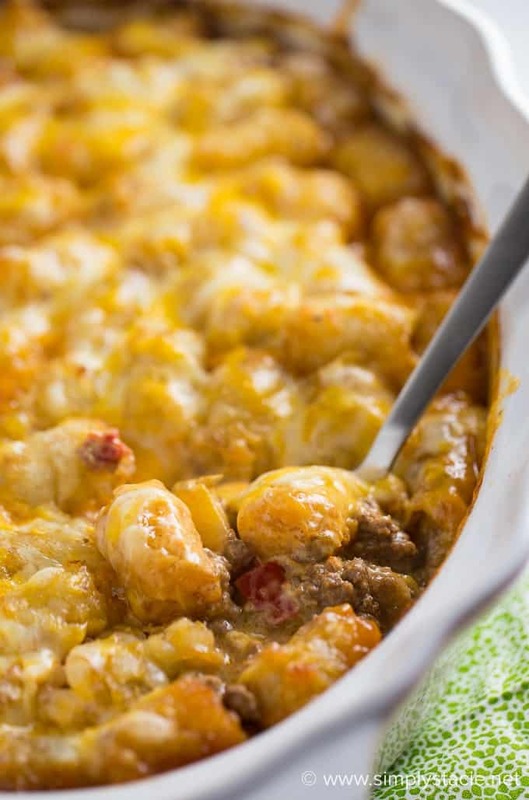 Pizza Tater Tot Casserole: This comforting casserole has three layers of goodness. Use your favourite pizza toppings to create the perfect family meal. More Tater Tot Casserole Recipes: A list of 20 mouthwatering recipes to enjoy. If you are looking for more comfort food casseroles, try my Slow Cooker Ham & Potato Hash, Santa Fe Chicken Tortellini Casserole and Spaghetti Pie. I also have a Casserole Pinterest board. Do you make Tater Tot casserole? Heat a large skillet over medium heat. Add onions, peppers and ground beef. Cook until beef is no longer pink and onions and peppers are softened, about 7 to 8 minutes. Stir in taco seasoning. Preheat oven to 400F. 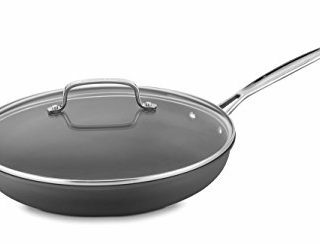 Grease a large casserole dish with cooking spray. Spread the beef mixture on the bottom evenly. Pour queso on top and spread to cover beef mixture. Cover with Tater Tots. Bake for 40 minutes. Remove from oven and sprinkle with cheddar cheese. Bake an additional 5 minutes, or until cheese is melted. Serve hot. I used yellow because it’s all my store had, but I don’t think it would matter much! I made this for supper tonight an it’s sooo good, my husband who is a picky eater love it too!!! Do you pre-cook the tater tots or put them in frozen? No, put them in frozen. You call it spicy, but there is nothing in it that is spicy, so I’m confused. Thanks! I melted Velveeta cheese with a cup of milk in microwave then added can of rotell instead of using tostitos queso jar… I also generously added mozzarella and cheddar cheese on top of tots at the end of the bake and threw in for another 5. It all was good. Made this with cauliflower tater tots and it was amazing!!! If you love Mexican food, how have you never heard of queso? Just made a batch to freeze for lunches, and was wondering how long you think it’d be good frozen. Thanks! It’s very good, or, at least, the bite I snuck was. Oh nice! I think at least three months! This was very good, but too spicy for my family. I would use a cheese sauce instead of quest next time. My husband really liked it. Next time I’m adding jalapeno and putting chips on top when serving. Thank u for the recipe!